That is, Carol’s birthday and Tomales Bay. Since we are now in the habit of trying to be in parts foreign over September, we are also in the habit of celebrating Carol’s birthday away from home. Usually, the venue has been France but this year, here we are in Tomales, California. We have also developed a preference for visiting restaurants at lunchtime rather than in the evening; lunchtime seems more relaxed and we have ended up somehow less disappointed with the results. This year, lunch was also the better option since we would have to be driving Bets and Bryan off to start their second vacation trip in the early evening. The day dawned cloudy and rain was expected at some point. Though sunny views would have been preferable, we decided to go for lunch at Nick’s Cove about half way down the east side of Tomales Bay. This turned out to be one of a series of establishments designed by Pat Kuleto, as in McCormick and Kuleto’s in San Francisco. Pat Kuleto is billed as a restaurant designer. Now there is specialization for you. Pat Kuleto’s reputation as a restaurant designer is prodigious. I’m used to restaurants being renowned for their chefs but here we have restaurants renowned for their designer. Food industry job titles are getting quite interesting. Cooking magazines frequently have glossy pictures of completed recipes, not only with the photographer credited but also a “food stylist”. “Food writer” is another specialization; I suspect this set of people can cook but do not have the skill set to survive a restaurant kitchen in the heat of battle. I’m now going to have to add “restaurant designer”, or some such phrase, to the battery of food industry specialist skills. Finally, of course, there are critics who don’t really have to do anything constructive at all. food critic – tells any or all of the above that they’ve done it wrong. 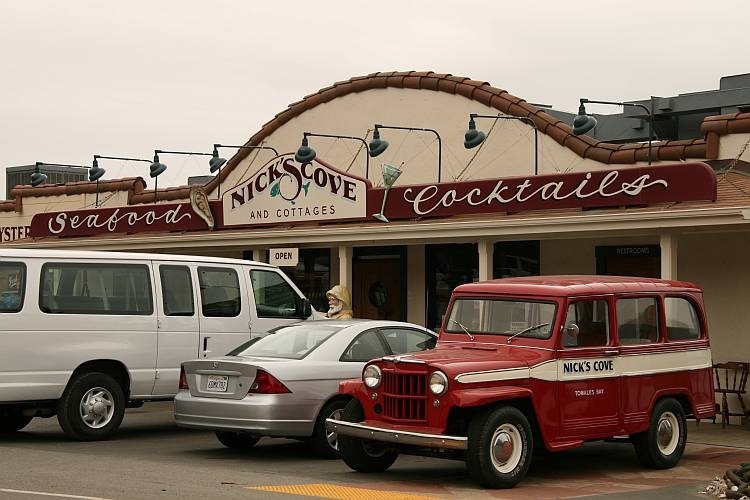 For all of that, Nick’s Cove provided us with an excellent lunch looking over the waters of Tomales Bay. We started by sharing chef’s selection of a dozen oysters on the half shell, four each of three different types. We both chose Dungeness crab for our main attraction, as crab cakes in Carol’s case and as crab enchilladas in mine. A bottle of Muscadet de Sevre et Maine, curiously in a most un-Muscadet-shaped bottle, toasted birthday girl’s success in surviving another year. All in all, a most enjoyable lunch in one of Mr. Kuleto’s pleasantly designed eating environments. Since we heard no more, I assume they made it in time for their flight to New York on stage one of their journey.